I would like to visually present my CRON jobs. Right now I only have three, but i'm planning on adding 10 more soon. I have tried googling for hours to find a suitable template to map this on. Automatically would be ideal, but even a template which I can recreate would be helpful. I have cron's that run every 30 mins, cron's that run once on sunday, cron's that run every couple of hours... I have not found a suitable way/template of visualizing this, mainly because it needs to be per 1/15/30min intervals? This helps in keeping an overview of what cron's exist + maybe spot any improvements in timings of these crons. I found the cronv tool on github, but it uses Linux and I don't have that available at the moment. I would prefer an excel-like template, if that exists. I've also looked at CircleEye but i'm unsure whether D3 will be suitable to visualize jobs running every x minutes? Does anyone have an idea how to visualize my cron job? Hope it will help you to understand the main points of my vision. 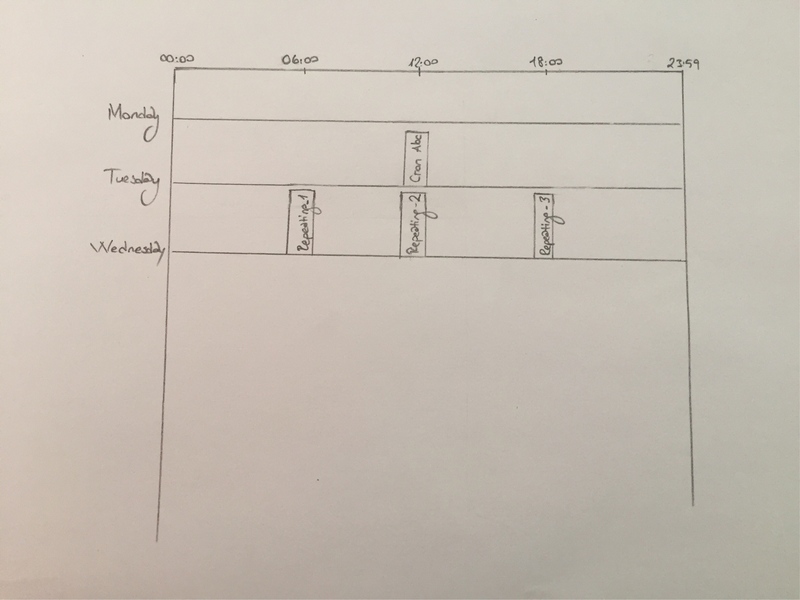 It actually consist of the axis of time (on axis x) above to display the same frame on each day and the days of the week displayed on axis y. Let me know if u need further help to understand, and no I either haven’t seen any perfect tool to visualize exactly this. You may make bigger time frame to present more cron jobs or even have repeating ones. You could consider using a data presentation library like Highcharts. The best part is it's purely web-based so you can monitor the jobs on or offline in your broswer. The charts are interactive and completely customizable too.